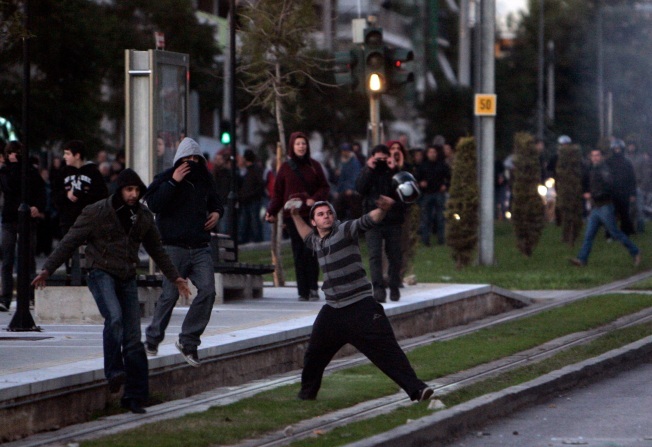 Youths throw stones towards riot police officers, not seen, Tuesday Dec. 9, 2008, after the funeral of a teenager shot by police Saturday. ATHENS, Greece — Rioters rampaged in Greek cities for a fourth day Tuesday in an explosion of rage that was triggered by the weekend police killing of a teenager — but has spread to an array of antiestablishment parties, threatening to topple the government at a time of deep anxiety over growing economic gloom. Gangs of angry youth have looted and damaged hundreds of buildings, including banks and hotels, torched cars and shut down much of downtown Athens. On Tuesday, police fired tear gas at protesters after the dead teenager, 15-year-old Alexandros Grigoropoulos, was buried in a funeral attended by about 6,000 people. Overnight, gangs of marauding masked youths roamed the streets, erecting burning barricades and pelting riot police with rocks and bottles. High school students joined self-styled anarchists — a group with a history of nighttime arson attacks on businesses and cash machines. But the protests also drew in a variety of left-wing groups, most of whom did not participate in the destruction. Opposition Socialist leader George Papandreou called for early elections, charging that the governing Conservatives were incapable of defending the public from rioters. Prime Minister Costas Karamanlis is clinging to a single seat majority in the 300-member Parliament, meaning that just one defection would likely bring him down and spark elections that polls suggest the opposition would handily win. The riots erupted at a time when the government is already facing public discontent over the state of the economy, the poor job prospects of students and a series of financial scandals that have badly rattled public confidence. However, the protesters have not articulated specific policy goals and the two leading parties are not far apart on the issues. The groups have now evolved into various mainly youth factions that claim to fight trends ranging from globalization to police surveillance cameras. On Tuesday, police fired tear gas to dispel dozens of youths throwing stones and sticks and setting trash cans on fire near the funeral for Grigoropoulos, whose death Saturday sparked the rioting. Dozens of local residents gathered on the streets, shouting at police to stop firing gas in the residential area. Schools and universities across Greece were closed on the day of the funeral and hundreds of teachers, university lecturers and students rallied in central Athens, where hundreds of teenagers threw rocks and scuffled with officers. Fighting also continued in Thessaloniki. "Everyone has let our children down ... Every day I see that students are becoming more hostile toward us and figures of authority," said Christos Kittas, who resigned as the dean of Athens University after the rioting spread to campuses. Police said rioters damaged or destroyed 200 stores and 50 banks in Athens overnight, while 20 buildings were damaged by fires, including downtown hotels that were temporarily evacuated late Monday. A further 100 stores were damaged in Thessaloniki. There was also rioting in Crete, the holiday island of Corfu, and in other areas around Greece. The circumstances surrounding Grigoropoulos' shooting are unclear, but the two officers involved have been arrested; one has been charged with murder and the other as an accomplice. A coroner's report shows the boy was shot in the chest.